Luminess Air Airbrush makeup is the most superior way to apply fast, easy & flawless cosmetics on your face and body everyday. Now, airbrushing has become super easy for ordinary gals to apply makeup with results that rival professional makeup artist. Airbrushing is no longer only for special occasions. And airbrushing generally takes 1/2 the time of applying compared to ordinary makeup. Learning to airbrush has never been easier or more fun. 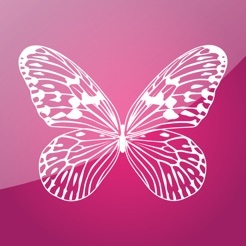 Enjoy simple and to follow step-by-step instruction to the basics of airbrushing, finding your airbrush color matching, how to covering imperfections, secrets to minimizing wrinkles & texture, cleaning your airbrush stylus, applying the most natural airbrush blush, concealing tattoos, bronzing your face & body, applying the most flawless eyeshadow and frequently asked questions. 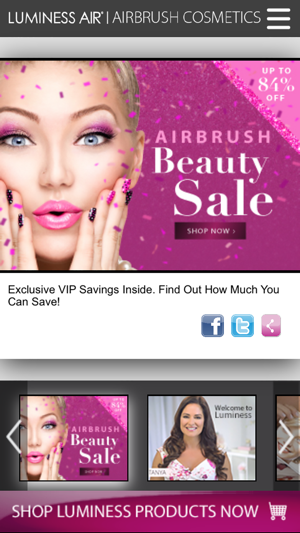 Plus, gain premiere access to Luminess events, sales and special promotions. 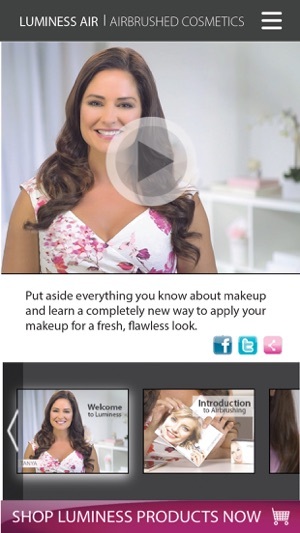 Let your mobile device or tablet become your personal makeup instructor in minutes. Learn the art of flawless airbrush perfection. Improvements to the Store UI which will give users more of a rich shopping experience. Ability for users to watch Live Chat with Luminess, a LIVE training session with an expert makeup artist to guide you through airbrushing. A new, simple menu control provides easy navigation to view and shop all of our products. Added ability to send color match requests directly from the app. Register your airbrush system warranty on the app. Downloaded the app thinking it would be a “one-stop-shop” for guidance on my new luminess system as well as a good place to purchase products. Wrong. I was never able to make a purchase through the app at all. It allowed me to look at all the products that I wanted to buy, but when it came time to add them to my cart, it would not function properly. The app pretty much forced me to sign up for some account using my email address, which I thought might help to get it to let me make a purchase but that was not the case. Then I was told to uninstall & reinstall the app as an attempt to correct the issue. This did nothing but waste more of my time because the issue was still the same. I would get my hopes up browsing around the sale items, thinking I might get several items at a great price, only to find that I couldn’t get any of those things into my cart. How frustrating! So I ended up going to the regular website to do my shopping, which was a bit more user friendly in that it actually let me make a purchase. I never had any problems with getting things in my cart until my last order, about a week ago. I checked my cart to make sure it was correct and checked out. When I checked out I printed my order and 3 or 4 items that were included in my cart were missing? I had printed my cart out and the items that were missing were actually in my cart at checkout! I went through the print out and checked the items that were missing and went through the process of ordering again. I’m really hoping that the problem is fixed by my next order! The only reason they get 2 stars is bc I genuinely love the product. The app and website are complete garbage. I can’t find order history or anything related to my account when I’m logged in. When I do manage to EVENTUALLY find it, next time I go back I’ve forgotten where it was bc it’s not under MY ACCOUNT bc I guess that makes too much sense for them. SO INCREDIBLY frustrating.